In Clouds is a production by Peter Power, Composer, Director and Sound Designer, for this years Cork Midsummer Festival 2018 which he has developed while on our Artist-in-Residence scheme at the NSF. 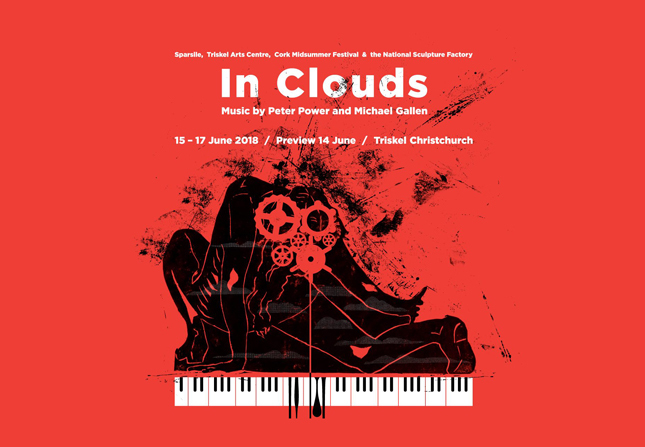 Peter and his entire team of In Clouds, would now like to invite all members of the National Sculpture Factory to the dress rehearsal of In Clouds which will be taking place next Wednesday June 13th at 9pm in Triskel Christchurch. If you are interested please send your name to Eimear Reilly at eimear.reilly1@gmail.com and let her know you are an NSF member by Sunday June 10th at 6pm. Led by director and co-composer Peter Power, In Clouds sees an award-winning group of artists come together to create a unique site-specific piece in Triskel Christchurch this June. This new immersive musical experience invites the audience alongside the artists, to examine the human struggle to encompass and understand scientific theory, natural phenomena and human behaviour. In Clouds ventures off course into a new musical world, creating an immersive experience which asks us to find comfort in a world of unknowns where we can abandon the notions of the clock for the cloud. In Clouds is funded by The Arts Council/An Chomhairle Ealaíon Music Project Award and Cork City Council Project Award. Co-commissioned by Cork Midsummer Festival and Triskel Arts Centre and developed in association with Tonnta. Supported by the National Sculpture Factory Artist-in-Residence programme, Shawbrook Hatch Residency and the Theatre Development Centre. Some of his recent work includes The Same by Enda Walsh and Corcadorca (Composer/Sound Designer) fLux by Eat My Noise (Co-creator, Composer), Override by Stacey Gregg (Composer, Sound Designer), ProdiJIG: The Revolution by Cork Opera House (Music Supervisor, Composer, Sound Designer), and Neon Western (Co-creator, Composer, Sound Designer). Peter is currently Artist-In-Residence in the National Sculpture Factory, engaged in a year -long collaboration with the building moving towards an exhibition/happening in 2018. Peter is also the winner of the 2017 Arts Council of Ireland Music Bursary award and the 2018 Arts Council of Ireland Music Project Award. Michael Gallen is an Irish composer and performer. Having been brought up primarily with Irish traditional and folk music, he later pursued studies in composition in Paris, and is most comfortable meandering at the borders of different musical styles. Recent work includes Wilde Stories, a suite for the RTÉ Concert Orchestra and Cór na nÓg responding to Oscar Wilde’s fairy tales; What You Forget, commissioned for the Ireland 2016 project and A Breaking, developed in collaboration with Chamber Choir Ireland. A new operatic work entitled Extraterrestrial Events (w. Company Philip Connaughton) premiered in Paris in March 2017, with further performances at Dublin Dance Festival (May) and Cork Opera House (October). Sara Baume is the author of Spill Simmer Falter Wither which won the Geoffrey Faber Memorial Prize in 2016 and is currently being translated into a dozen different languages. Her second novel, A Line Made by Walking, was shortlisted for the Goldsmiths Prize in 2017. Her non-fiction has also been widely published, and she works as a visual artist as well as a writer. Stephanie is a dancer, actress and choreographer from the West of Ireland currently based in Dublin. In 2012 Stephanie graduated from the Rotterdam Dance Academy in the Netherlands with her BA in Dance. Since then she has worked nationally and internationally for companies and choreographers such as Protein Dance, Icon Dance, Nuno Silva, Emma Martin (United Fall), Nuno Silva and Dam Van Huynh, Jessica Dessner and Jefta Van Dinther. In 2017 Stephanie graduated from the two year full time programme at Bow Street, the Academy for Screen Acting in Smithfield. Stephanie has appeared in a number of short films, music videos and commercials since and has worked with Directors such as Jim Sheridan, Shimmy Marcus and Brendan Canty. Stephanie’s second choreographic work with frequent collaborator Laura Sheeran was commissioned for the Clonmel Junction Festival in 2016. Stephanie’s work as a choreographer is supported by the Arts Council of Ireland and Dance Ireland and has been performed as part of Galway Culture Night, the opening of Music for Galway 2017 and New Movements in Dance House.